With the approach of Shavuot – Zeman Matan Torahseinu – our thoughts inevitably turn to the crucial role Torah plays in our lives. Have you every considered why we refer to this Chag as "the time of the giving of the Torah" rather than "the time of receiving the Torah"? Perhaps the message is that even though the Torah was given only once, thousands of years ago, the opportunity to receive it is always there for the Jew who cares. The best expression of this concept is the manner in which talmidim of Ohr Somayach have over the past forty years "received the Torah" in our yeshiva, each in his own time. Receiving of the Torah is not limited, however, to the time spent in yeshiva. Every time you find the time in your busy schedule to participate in a shiur, study with a chavrusa or otherwise engage in learning Torah you are receiving the Torah. Every time you show your appreciation of what you received at Ohr Somayach by helping support the yeshiva, you are enabling so many others to receive the Torah and join the proud ranks of Ohr Somayach products. Jewish Learning Exchange (JLE) – the traditional intersession experience of learning and touring. Hasbarah– a program of learning Torah combined with gaining familiarity with Israel which has the sponsorship of the Israel Foreign Ministry. J-Internship– a dynamic new program of combining Torah study with a part-time internship placement in a local business or non-profit organization. Peer Educator Research Internship (PERI) – second year of a special internship program for an elite group of students preparing themselves for teaching a subject of Judaism on campus. London JLE– Genesis – a Jewish Leadership program for university students. Mentors Mission– another Mentors Mission, including a number of alumni, will be interacting with some of the above-mentioned programs when it arrives at the beginning of July. The annual Yom Iyun drew a large crowd to hear the world-famous Ohr Somayach lecturers Rabbi Yitzchak Breitowitz, Rabbi Dovid Gottlieb and Rabbi Akiva Tatz discuss "A View of Heaven from Earth – Re-examining Our Beliefs to Enrich our Lives". This tenth annual Yom Iyun Evening of Learning took place on May 18th at the North Shore Center in Skokie, IL. Recordings of the lectures are available for download at www.ohr.edu or by clicking here. 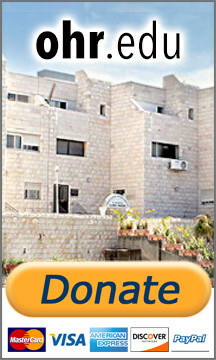 Renovation of this important learning facility where so many alumni got their start has been made possible by a grant from the family of alumnus Rabbi Reuven Lauffer, in memory of his recently deceased mother. Rabbi Lauffer, who initiated this effort, gives a daily shiur in the Shoresh Introductory Program. A new sefer by alumnus Dovid Moskoff joins the dozens of sefarim and books authored by former talmidim. "Vayivorech Dovid" on Mesechta Shabbos is the latest volume in the series of sefarim this outstanding avreich now learning in the Mir Yeshiva has produced. If you would like to share your simchas with other Ohr Somayach Alumni please email them to alumni@ohr.edu and we will be happy to include them in our newsletters. May Hashem bless you and yours with a Chag Somayach.